As the sole originator for IBS Investment Bank, Institutional Banking Services, N.A. CORP offers unique expertise in the underwriting and origination debt/equity financing for borrowers and sponsors located on the North, South and Central American Continents. Below are select transactions that reflect IBS N.A. 's capabilities. Please contact a Relationship Manager for trasaction specific quesitons. For nationally covered releases go to www.ibsinvestmentbank.com or click here. IBS Investment Bank Provides CRE Acquisition Financing to J. L. Tools and Supplies Inc.
IBS Investment Bank a division of Institutional Banking Services N.A. CORP Provides CRE Acquisition Financing to J. L. Tools and Supplies Inc.
IBS, N.A. 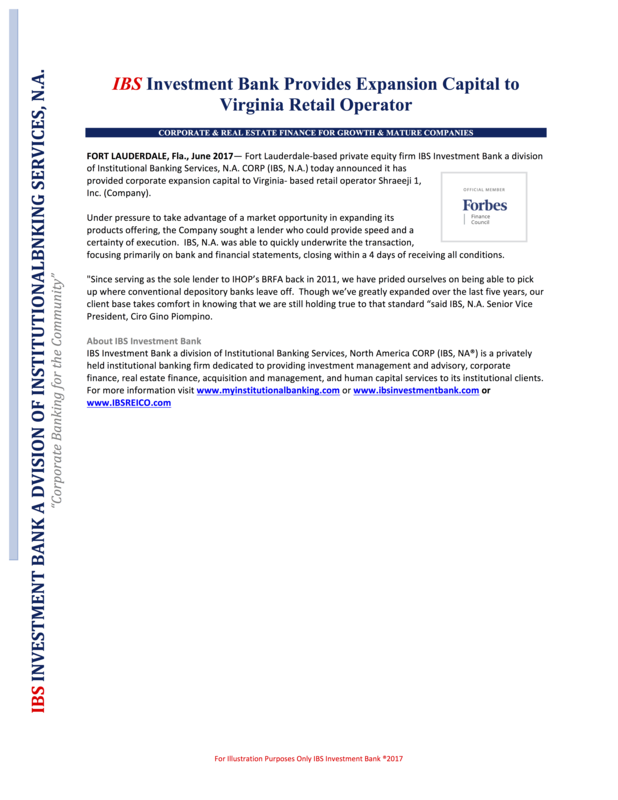 Exits 3 Key Investments and Positions to Re-Investment Additional $400MM Throughout Eastern U.S.
IBS Investment Bank a Division of Institutional Banking Services N.A. 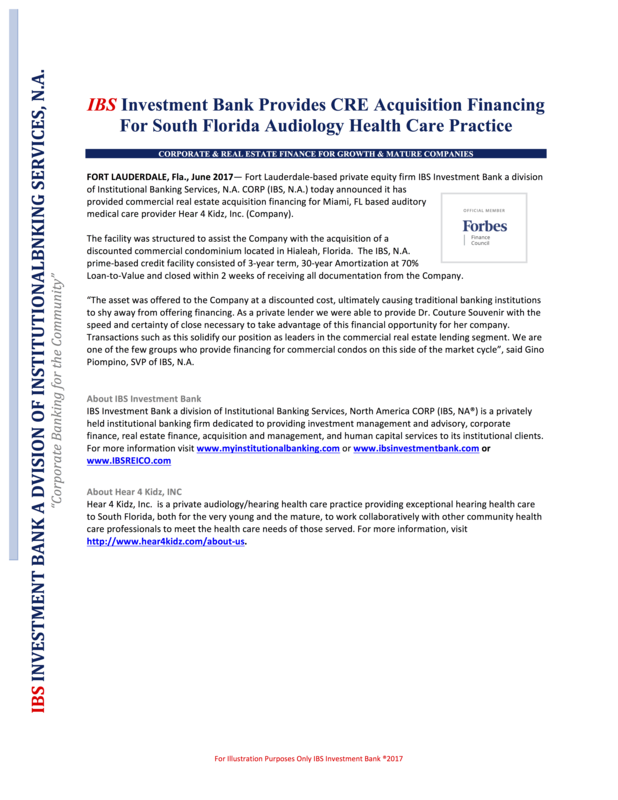 CORP Exits 3 Key Investments and Positions to Re- Investment Additional $400MM Throughout Eastern U.S.
IBS Investment Bank Provides Expansion Capital for Advanced Case Parts, INC.
IBS Investment Bank a division of Institutional Banking Services, N.A. 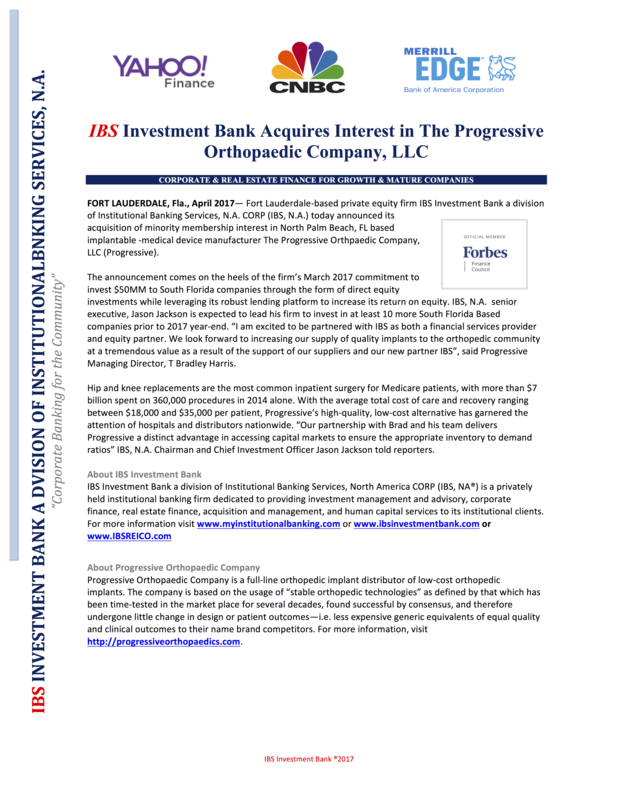 CORP Provides Expansion Capital for Advanced Case Parts, INC.
IBS Investment Bank Provides Expansion Capital for The Progressive Orthopedic Co, LLC. IBS Investment Bank a division of Institutional Banking Services, N.A. CORP Provides Expansion Capital for The Progressive Orthopedic Co, LLC. IBS Investment Bank Provides Expansion Capital for Medison Econet, INC.
IBS Investment Bank a division of Institutional Banking Services, N.A. CORP Provides Expansion Capital for Medison Econet, INC.
IBS, Investment Bank Provides Growth Capital for Agaia, INC.
Why Depository Banks Send Investment Real Estate Loans to IBS, N.A. Why Depository Banks Send Letter of Credit Request to IBS, N.A. Use our website to familiarize yourself our platform and schedule an appointment to put your money in action using our secure contact form.